Stress, poor diet, age, nutrient deficiency, hairstyling techniques and improper haircare all contribute to thinning hair. Whereas the power of many botanical ingredients, such as coconut oil, in repairing damaged scalp and strands have been widely recognized, argan oil shampoo reviews are raving about the power of argan oil to restore hair health. This product is ideal for you if you have hypersensitive scalp and skin. The formulation is free from parabens, sulfates, silicones, formaldehyde and gluten - top ingredients that frequently cause irritations and inflammation on sensitive skin types. What makes this shampoo even better is that it infuses the wonderful light scents of vanilla and honey, leaving your hair so irresistibly fragrant. Maple Holistics is also offering this product in exchange for reviews. In this product, the restorative power of argan oil is combined with other hair health giving nutrients that include biotin and botanical keratin. This product is specially formulated to stimulate growth down to the cellular level necessary to reverse years of damage from washing with harmful chemicals to hairstyling that cause hair to fall out and become brittle. This product combines 100% pure Moroccan argan oil with avocado oil, coconut oil, jojoba oil,almond oil, camellia seed oil and botanical keratin. aVo Organics is a company committed to providing only 100 per cent natural ingredients. It guarantees product is gentle enough for daily use. This product is sulfate-free and is guaranteed safe for use on color-treated hair. Unlike many botanical products, argan oil comes on top of the ingredients list of this shampoo which guarantees that you’re getting loads of this helpful essential oil and is not just being incorporated in the product at low concentrations. 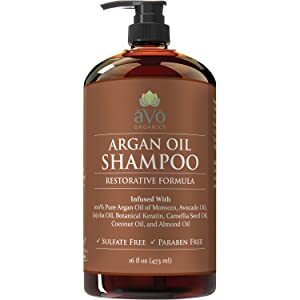 Yet another argan oil shampoo that taps the hair health giving nutrients from other botanical ingredients that include aloe vera, rosemary, thyme, white willow bark and burdock root. This product is complemented with a conditioner. Together, the shampoo and conditioner leave your hair shiny and full of volume. All ArtNaturals products are sourced from the best oils around the world and handcrafted for safe and nourishing use. What Argan oil Can Do for Your Hair? Our hair strands are made mostly of proteins, the structure and arrangement of which is what’s responsible for making our tresses appear soft and shiny. Argan oil supports healthy hair regrowth, protects strands from damage caused by free radicals and UV radiation, and helps keep it looking and feeling healthy. Argan oil is made from the kernels of the argan tree which are grown in abundance in Morocco. Its high levels of Vitamin A, Vitamin E and other antioxidants, and oleic and linoleic fatty acids makes it the ideal haircare ingredient to restore hair damage, including those acquired from frequent styling and hair dyeing. The best argan oil shampoo for hair, therefore, should be able to preserve these natural health-giving properties of argan oil. How does Argan Oil Boost Your Hair Health? There are many things you do to your hair everyday that can damage your strands-hair coloring, heat treating and using harsh hair products among which. Why Argan Oil is Better than your Ordinary Shampoo? Commercial shampoos are often laden with too much alcohol content which diffuses the ingredients that support cleaner, more beautiful hair and scalp. Worse, these more common types of shampoos hurt your hair by breaking past the cuticle and drying up your tresses. When this happens, your hair ends up looking rough and frizzy. As you use these products regularly, your hair becomes brittle and the damage keeps piling up. Instead, you should be going for products that deeply penetrate your hair to nourish it inside and out without causing cracks in your hair cuticle. concluded that argan oil helped minimize damage caused by hair dyeing when used as a post-color treatment formula. On its own or in combination with cupuassu butter, the hair health treatment effect remains significant. What argan oil does, according to the study, is minimize the loss of hair proteins when color treating hair. With the growing evidence around the efficacy of argan oil to penetrate and deep treat hair, more and more people, both manufacturers and consumers alike, are getting their hands on this trending hair product. Whether it is coconut oil or argan oil that best treats damaged hair, however, remains highly arguable. Be very careful if you’re planning to try out what this botanical wonder can do to your hair, however, because not all argan oil shampoos are the same. 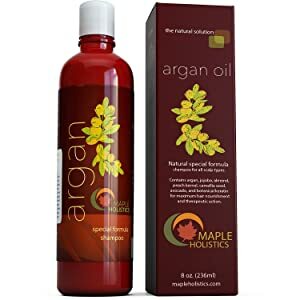 Based on the foregoing review, our best argan oil shampoo from this list of five will have to be Maple Holistics Argan Oil. I hope the above information will help you find the best one for you base on your hair condition plus your purpose and enables you to get rid of your hair problems. If you have any queries, feel free to drop a comment. I would be glad to share my experience!